Germany has dedicated itself to never forgetting the Holocaust. There are Holocaust monuments, museums, and concentration camp memorials that educate the public and honor the millions of victims. Many visitors to Europe feel compelled to visit these sites, and they should. The Holocaust is one of the most significant events of the 20th century. But keep in mind that memorial sites offer an unflinching look at what happened here and you should be respectful when visiting Holocaust Memorials in Germany. For a complete listing of all European Holocaust Memorials (like the infamous site in Poland simply known as Auschwitz), visit the Information Portal to European Sites of Remembrance. 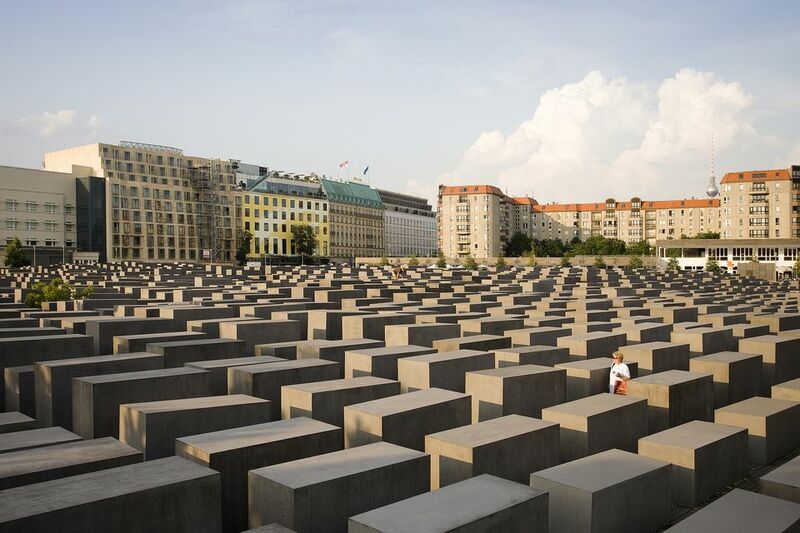 It is impossible to miss Berlin's Memorial to the Murdered Jews of Europe. Almost 5 acres between Brandenburg Gate and Potsdamer Platz are covered in the “Field of Stelae” with more than 2,500 geometrically arranged concrete pillars. After a contentious competition to decide the winner, architect Peter Eisenmann's design started taking shape. This site allows visitors to enter from all four sides and walk through the unevenly sloping field, becoming lost amidst the increasingly towering columns. All slightly different in size, wandering through evokes a disorienting phenomenon. The adjacent underground museum holds more personal touches such as the names of all known Jewish Holocaust victims and select stories of their journey. Just across the street in the Tiergarten lies the small Memorial to Homosexuals Persecuted Under Nazism, and moving towards the Reichstag is the newly opened Memorial to the Sinti and Roma Victims of National Socialism. Much more discrete, you can also find the placard marking where Hitler's Bunker once stood in the vicinity. You might not notice these memorials walking around German cities. Stolpersteine literally translates to "stumbling stone" and they are easy to miss placed within the cobblestones. The concentration camp of Dachau, lies 10 miles northwest of Munich. It was one of the first concentration camps in Nazi Germany and would serve as a model for all other camps in the Third Reich. Visitors to the memorial site follow the "path of the prisoner", walking the same way prisoners were forced to after their arrival in the camp. You will see the original baths, barracks, courtyards, and the crematorium, as well as an extensive exhibition and various memorials. About 30 minutes north of Berlin lies the memorial site Sachsenhausen, a former concentration camp in Oranienburg. The camp was erected in 1936 and more than 200,000 people were imprisoned here by the Nazis. Sachsenhausen was in one of the most important concentration camps in the Third Reich: It was the first camp established under Heinrich Himmler and its layout was used as a model for almost all concentration camps in Germany. After the camp was liberated on April 22, 1945, the Soviets used the site as an internment camp for political prisoners until 1950. In 1956, plans began to form to transform the camp into a national memorial. It was opened on April 23, 1961 and is now open to the public as a museum and a memorial. The Jewish Museum in Berlin covers the scope of the Jewish experience. It chronicles Jewish life in Germany from Roman times to present day. The striking architecture of Daniel Libeskind’s building makes palpable the feelings of those who were exiled and lost. The shape of the museum is reminiscent of a shattered Star of David, irregularly shaped windows are cut into the steel-clad facade, and voids stretch the full height of the building. The Holocaust Tower and the art installation “Fallen Leaves” are another moving and unique experience. More than 250,000 people from 50 nations were imprisoned in the former camp Buchenwald, close to the city of Weimar. The memorial site houses various exhibitions and you can also see the former grounds of the camp, the gatehouse and detention cells, watchtowers, crematorium, disinfection center, railway station, SS quarters, quarry, and graveyards. There are walks throughout the extensive site, including the routes taken by the former patrols. Bergen-Belsen in Lower Saxony became an international symbol for the horrors of the Holocaust. Anne Frank was imprisoned in this camp and died of Typhus in March of 1945. Today, the grounds of the former concentration camp are a cemetery with various sculptures saluting the ones who suffered and died here. There is also a Documentation Center, which houses all documents, photographs, and films exploring the history of the camp. The Neuengamme concentration Camp in a former brick factory in the outskirts of Hamburg was the largest camp in the North of Germany. It included 80 satellite camps between 1938 and 1945. In May 2005, on the 60th anniversary of the camp’s liberation, a redesigned memorial site was opened including several exhibitions that document the history of the site and remember the suffering of over 100,000 people imprisoned here. Fifteen historic concentration camp buildings on the site are preserved. Visitors can stand in the very room where the Endlösung or "Final Solution" (ie the Holocaust) was planned out. Now a memorial site, the House of the Wannsee Conference is another mandatory historical stop for people retracing the steps taken toward the mass genocide of approximately 11 million people. The concentration camp Flossenbürg, built in 1938, is located in the Upper Palatinate region in Bavaria. Dietrich Bonhoeffer, an influential German pastor and theologist, was imprisoned here and died only 23 days before Flossenbürg was liberated in April 1945. The Memorial offers a guided tour in English, which includes parts of the historic exhibition "Flossenbürg Concentration Camp, 1938-1945."